Textile arts and fiber arts include fabric that is flexible woven material, as well as felt, bark cloth, knitting, embroidery, featherwork, skin-sewing, beadwork, and similar media. Textile arts are one of the earliest known industries. Basketry is associated with textile arts. While humans have created textiles since the dawn of culture, many are fragile and disintegrate rapidly. Ancient textiles are preserved only by special environmental conditions. The oldest known textiles in the Americas is some early fiberwork found in Guitarrero Cave, Peru dating back to 10,1000 to 9,080 BCE. The oldest known textiles in North America are twine and plain weave fabrics preserved in a peat pond at the Windover Archaeological Site in Florida, the earliest dating to 6,000 BCE. As previously mentioned, fragments of rope and textiles dating back between 12,100 and 11,080 years ago have been unearthed from Guitarrero Cave in Peru. Because of the extremely dry conditions of the desert sands, twined textiles from the Norte Chico civilization in Peru have survived, dating back to 2500-1800 BCE. Cotton and wool from alpaca, llamas, and vicuñas have been woven into elaborate textiles for thousands of years in the Andes and are still important parts of Quechua and Aymara culture today. Coroma in Antonio Quijarro Province, Bolivia is a major center for ceremonial textile production. An Aymara elder from Coroma said, "In our sacred weavings are expressions of our philosophy, and the basis for our social organization... The sacred weavings are also important in differentiating one community, or ethnic group, from a neighboring group..." Aguayos are clothes woven from camelid fibers with geometric designs that Andean women wear and use for carrying babies or goods. 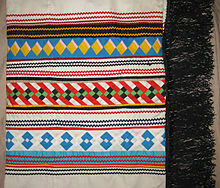 Kuna tribal members of Panama and Colombia are famous for their molas, cotton panels with elaborate geometric designs created by a reverse appliqué technique. Designs originated from traditional skin painting designs but today exhibit a wide range of influences, including pop culture. Two mola panels form a blouse, but when a Kuna woman is tired of a blouse, she can dissemble it and sell the molas to art collectors. Mayan women have woven cotton with backstrap looms for centuries, creating items such as huipils or traditional blouses. Elaborate Maya textiles featured representations of animals, plants, and figures from oral history. In modern times, weaving serves as both an art form and a source of income. Organizing into weaving collectives have helped Mayan women earn better money for their work and greatly expand the reach of Mayan textiles in the world. Pieces of 7,000- to 8,000-year-old fabric have been found with human burials at the Windover Archaeological Site in Florida. The burials were in a peat pond. The fabric had turned into peat, but was still identifiable. Many bodies at the site had been wrapped in fabric before burial. Eighty-seven pieces of fabric were found associated with 37 burials. Researchers have identified seven different weaves in the fabric. One kind of fabric had 26 strands per inch (10 strands per centimeter). There were also weaves using two-strand and three-strand wefts. A round bag made from twine was found, as well as matting. The yarn was probably made from palm leaves. Cabbage palm, saw palmetto and scrub palmetto are all common in the area, and would have been so 8,000 years ago. Experimental contemporary textile artists include Martha Gradolf (Ho-Chunk), whose work addresses historic injustices against native peoples, and Marie Watt (Seneca), who creates installations and interactive artworks using blankets as a metaphor. Navajo rugs are woven by Navajo women today from Navajo-Churro sheep or commercial wool. Designs can be pictorial or abstract, based on traditional Navajo, Spanish, Oriental, or Persian designs. 20th century Navajo weavers include Clara Sherman and Hosteen Klah, who co-founded the Wheelwright Museum of the American Indian. Valencia, Joseph and Ramona Sakiestewa (Hopi) and Melissa Cody (Navajo) explore non-representational abstraction and use experimental materials in their weaving. Traditional textiles of Northwest Coast tribes are enjoying a dramatic revival. Chilkat weaving and ravenstail weaving are regarded as some of the most difficult weaving techniques in the world. 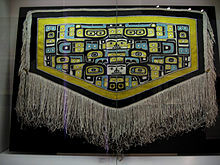 A single Chilkat blanket can take an entire year to weave. In both techniques, dog, mountain goat, or sheep wool and shredded cedar bark are combined to create textiles featuring curvilinear formline designs. Tlingit weaver Jennie Thlunaut (1892–1986) was instrumental in this revival. Button blankets are wool blankets embellished with mother-of-pearl buttons worn on significant occasions, such as potlatches. ^ a b Stacey, Kevin. "Carbon dating identifies South America's oldest textiles." University of Chicago Press Journals. 13 April 2013. ^ Spike, Tamara. "Review of Doran, Glen H., ed., Windover: Multidisciplinary Investigations of an Early Archaic Florida Cemetery". Humanities and Social Sciences Online. Retrieved 11 January 2012. ^ Brown, Robin C. (1994). Florida's First People: 12,000 Years of Human History. Sarasota, Florida: Pineapple Press. p. 23. ISBN 1-56164-032-8. ^ Milanich, Jerald T. (1994). Archaeology of Precolumbian Florida. Gainesville, Florida: University Press of Florida. pp. 74–75. ISBN 0-8130-1273-2. Gibbs, Charlotte Mitchell. Household Textiles. Boston: Whitcomb & Barrows, 1912. Wikimedia Commons has media related to Indigenous textile arts of the Americas.